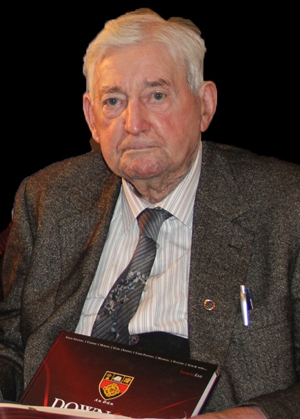 THE death of Paddy Mac Flynn (96) yesterday has saddened the world of Gaelic sports. He was due to attend an autobiography book launch in the Canal Court Hotel in Newry. A Down GAA spokesperson on behalf of the Board said: “It is with deep sadness that Down GAA has learned of the death of our esteemed and much loved Uachtarán Paddy Mac Flynn. “Paddy was a tremendous servant to the GAA. From his earliest days as a founding member of O’Donovan Rossa GAA Club in Magherafelt, to his last attendance at a meeting of Coiste Banisti in Down on the 29th April this year. The late Paddy Mac Flynn. “Indeed at that meeting which had been called to discuss the proposed Football review within Down, Paddy informed the members that ‘this was a massive job and the County would have to deliver on this task‘. “”Profound words indeed from a man who always delivered on the tasks at hand. A man who first came to Down as an administrator back in 1949 and served on East and South Down Boards, was Treasurer of the County Committee from 1955 to 1973 and Central Council and Ulster Council Delegate for many years. It was indeed a very proud moment when Paddy was elected Uachtarán of Cumann Luthchleas Gael in 1979. His leadership in that period ensured that the GAA continued to grow and develop as the biggest amateur sporting organisation in this country and beyond. The Deputy First Minister said: “I was sorry to learn of the passing of Paddy McFlynn and my thoughts and prayers are with his family and friends at this time. “Paddy demonstrated true leadership qualities from an early age and was one of the founding members of O’Donovan Rossa GAC, Magherafelt at 16 years of age. He held the positions of Derry GAA Secretary, Ulster President before serving as GAA President between 1979 and 1982. “In May I was fortunate to meet up again with Paddy at an event organised by the Ulster Council and Derry County Board. The display of the minutes of the meeting at which Paddy was appointed County Secretary 73 years ago generated an immediate round of applause from the audience and Paddy generously shared with us some of his early memories.